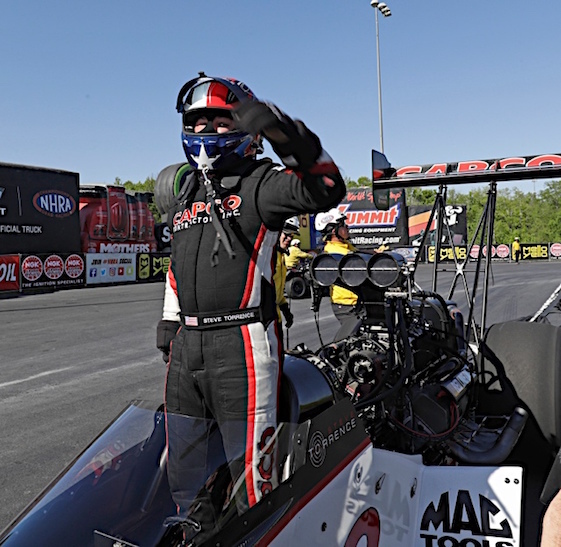 On the November afternoon when Steve Torrence publicly was honored by his hometown folks, the reigning NHRA Top Fuel world champion was reminded about his place in the celebrity hierarchy of Kilgore, Texas. Nevertheless, Torrence was feted via official proclamation during ceremonies conducted by Mayor Ronnie Spradlin, City Manager Josh Selleck and a host of officials at the Texan Theater. Torrence and the Capco Contractors/Torrence Racing team led by crew chief Richard Hogan claimed their first professional championship together with an 11-victory season featuring an unprecedented sweep of NHRA’s six-race/24-round Countdown to the Championship playoffs. To repeat _Torrence completed the 2018 season as the first driver in NHRA history, regardless of classification, to sweep the six-race Countdown. NHRA’s all-too-brief offseason ended last weekend at Wild Horse Pass Motorsports Park in Chandler, Ariz., near Phoenix. On cue, Torrence posted the quickest run of the meet, covering the 1,000-foot distance in 3.689-seconds at 328.78 mph. Indeed, Torrence will roll into Friday’s first two rounds of qualifications for the 59th annual NHRA Winternationals in Pomona, Calif., chasing additional history. A victory Sunday at Auto Club Raceway would allow Torrence to equal eight-time world champ Tony Schumacher’s record of seven straight tour wins. Fittingly, Torrence capped his massive 2018 season last November with a victory in the Auto Club Finals. Torrence finished 304 points in front of runner-up Schumacher, who will not compete at Pomona this weekend due to a lack of sponsorship. Doug Kalitta (Top Fuel), Matt Hagan (Funny Car) and Bo Butner (Pro Stock) were last year’s winners of a race that will be televised on FOX Sports 1 (FS1), including three hours of finals coverage beginning at 5 p.m. (EST) on Sunday, Feb. 10. It’s the first of 24 events during the 2019 Mello Yello Drag Racing Series season. Following is an edited transcript of Torrence’s post-championship interview with RacinToday.com. Conducted via phone from his ranch north of Laredo, Torrence spoke about his historic 2018 season with “them Capco Boys,” his family-owned business and his big-dollar car toys. RT: You wrapped up the championship in Round 5 of the Countdown at The Strip at Las Vegas Motor Speedway. So what was it like heading into Pomona for the season-finale, and a shot at history? STEVE TORRENCE: “Yeah, we had thought about it quite a bit going into that race. I mean, you try to not let it get it in your head but you still think, well, hell, the fact and the reality of it is if we do it nobody can beat us to it. Only way it’ll change is if they change the amount of races. So, you start putting your name in line and in position with some of the greats and it’s pretty humbling to say, ‘Heck, we set a mark we’re going to be remembered forever for doing.’ And as a single-car team. RT: Competing for the most part as a single-car team, do you envy multi-car organizations like Don Schumacher Racing and all their human capital, expertise and sponsorship? STEVE TORRENCE: “No, I don’t envy them. I think that we’re as well-prepared and have all the resources. I think that when you start adding multiple cars it gives you an advantage but we’re not at that point. We’re not where we need to have two or three of these things out there or where we can sustain that. “There is an advantage to it if you can get that other data. But it has to be where the teams work together. If it’s two completely independent teams that don’t communicate and don’t share information, then it’s really no advantage. So it needs to be a true team. I see some of the other multi-car teams and I know how the inner workings of them are, know their secrets, and they’re not communicating and that changes the look of that. RT: Your primary funding is provided by Capco Contractors, the company founded by your parents, Billy and “Mama Kay” Torrence. Do you intentionally steer away from corporate sponsorship? RT: No corporate sponsor also means no corporate obligations at the racetrack or during the week, so you’re not beholding to anyone, right? RT: Your shot at the 2017 Top Fuel title basically ended when you crashed during the FallNationals at Billy Meyer’s Texas Motorplex in Ennis. Brittany Force, of John Force Racing, went on to win her first title by 81 points and you were critical of NHRA’s “welfare point system” and your fate. So, what did you learn about yourself from all that? STEVE TORRENCE: “Given the way everything went and how well we were running, we did learn some of our weaknesses, where we weren’t as prepared as what we needed to be given that situation. And I think 90 percent of the teams wouldn’t be and until you’ve been there, you don’t know how to prepare for it. So that changed our routine for the 2018 season. That’s why in the middle of the year we pulled out another car and started testing through the Western Swing with another car and completely got it ready and put it back up (in the hauler). So in the event that we needed to pull a brand new car down and race the next round we were (ready). RT: You’ve also mentioned “the Good Lord” during any number of interviews. So, do you believe in Divine Intervention? RT: Business-wise, your father, Billy, founded Capco Contractors in 1995. Google describes Capco as a full-service pipeline company located on 30 acres in Henderson, in East Texas, specializing in compressor stations, site work, mainline pipe construction and pipeline integrity projects. Where do you fit into the daily activities at Capco? RT: Do you have experience working “in the field” for Capco, as opposed to your current office duties? RT: Ironically,your father was a welder in the construction industry before striking out on his own, and your mother worked as a maid. You’ve often mentioned your “humble beginnings” in previous interviews and growing up in a middle-class family. Safe to say that describes a life based upon conservative values? RT: You’ve also referred to yourself as a “redneck” during interviews in various media centers, in print publications and online. It’s a tag you actually wear proudly, right? RT: Your award-winning public relations representative, Dave Densmore, says you have an impressive collection of big-boy car toys. What do you drive away from the racetrack? STEVE TORRENCE: “I’ve got a couple Porsches and I’ve got a Ferrari. My dad has a McLaren and a couple Porsches…and honestly, one of the Porsches is a (911) GT2 RS, the first one. It has 900 miles on it. My dad has two of the GT2 RS’ _ the one from 2010 and the one that came out in 2018. I think they made 800 of the latest edition and 500 of the first. So we each have one of those and I got a new GT3 RS…honestly, I’ve driven the GT3 a couple times. The GT2 has 900 miles, my Ferrari has like 1,200. I just don’t drive ‘em a bunch. “The GT2 RS I’ve got is the 2010 model…it’s insane. It’s the twin-turbo…think mine is No. 488 out of 500 and dad’s is No. 373. Those things are insane. It’s basically the GT3 Cup car with the twin-turbo engine in it and it’s fun to drive. But they call it ‘The Beast.’ Like, the engineer signed the underside of the hood for every one of us because they were sold before they ever came to the United States. The GT3 RS I just got is a blast because it’s got a naturally aspirated engine, it’s not as peaky, it’s more controllable and fun to drive. “I told my dad that GT2 is already an eight-year-old car with 900 miles on it and it’s just sitting there and it’s already appreciated close to $200,000. We give right at $250,000 for ‘em and now you can get ‘em for $450,000. I’ve had people that have actually got in touch with the dealership that we bought ‘em from and had people call me to buy it. A guy from California, a guy from Florida…and they’re wanting one. RT: Your tuning crew is led by Richard Hogan, assisted by Bobby Lagana Jr. and Justin Crosslin. Hogan joined your team in 2014 after stints with superstars “Big Daddy” Don Garlits, Kenny Bernstein, Don “The Snake” Prudhomme and Gary Scelzi, where he worked with nitro guru Alan Johnson. Hogan has been described as a “journeyman” but you’ve said your relationship with him is “brother-like.” Why him to lead your team? RT: Along those lines, you and your team have recorded 19 wins over the last two seasons. You’ve won 12 straight final-round matches. You guys are THE target, so are you ready to defend and repeat? RT: Was it good to get out of the race car for a while in November, and let the championship hoopla soak in? RT: Finally, I read when you were a senior in high school you had teen-age plans to get out of Kilgore ASAP. So, did you have an actual exit strategy for life outside of your hometown?